Now that the polar vortex has split into three pieces, extremely cold weather is forecast for large swaths of the country, including the East Coast and Midwest. It’s time, then, not only to get out your snow shovels, long johns and insulated boots, but also to start dreaming about nicer weather and planning some spring flings with your pet. Hey, it’s not that far away—less than two months—so we thought we’d toss out some ideas so you can while away the icy hours planning and scheming your escape. 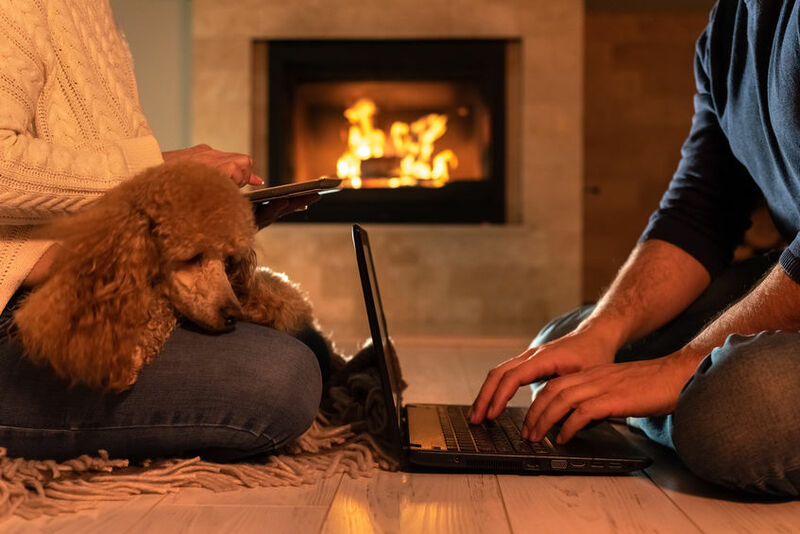 At Petswelcome, we know that other than sitting next to a crackling fire with a warm drink of your choice, nothing chases away the winter blues better than indulging in some pet friendly wanderlust and letting your imagination take you wherever you’d like to go. Spring is a great time to travel precisely because it’s an awakening, one fostered by biological, or circadian, rhythms stimulated by seasonal change. (We don’t really know what that means but we try to sound smart at least once in every article we write for The Weekly Bone.) The important thing is that after a period of prolonged cold weather and darkness, your mind and body are hyper alert to new sensory input so, when you travel to different places in the spring, your experience will seem that much richer. Destinations with warmer climates are obvious places to visit because, well, they’re warm. However, we suggest you think outside the box and consider other destinations that will provide different pleasures than simply being temperate. For example, visit a place that you love and have traveled to in the summer and see it in a different season. We guarantee it will be less crowded and you will feel more relaxed, allowing you the opportunity take in the sites in a way that will give you even more appreciation of the area. My family often vacations in Rhode Island in August. Last year, we visited in April and were amazed how quaint even busy places like Newport seemed. We roamed Bannister’s Wharf and Thames Street with our two large dogs which is something we never do in the summer because of the huge crowds. In addition, many beaches allow pets which they don’t after May 31st when it’s hard to even find an empty patch of sand to lay your towel. Also, the slant of light is not the same as in the summer and so it draws your attention to different facets of your surroundings. Our experience was so rewarding that we’re now thinking of alternating our vacations in Rhode Island between spring and summer every other year. If you don’t have a specific place in mind, we suggest you check our Vacation Destinations page. As we discuss in that section, sometimes finding the perfect pet-friendly destination isn’t always about finding a particular city. Sometimes it’s about your state of mind, an imagined place that you want turn into reality—one based on a mood that desires, for example, the laidback feel of the Florida Keys. Or maybe you’re looking for a particular type of landscape such as the raw beauty of the Oregon Coast. All you have to do is click on our Vacation Destination dropdown menu to get some ideas. Or close your eyes, click and see where serendipity takes you. Crabapple in Madison Square Park. The popular notion of New York as a concrete jungle is put to rest if you head there in spring. Of course, we may be prejudiced because it’s our hometown, but if you want to get a glimpse of the Big Apple at its most beautiful, there’s no better time than April and May, when the flowering trees that fill the parks, avenues and streets are in full bloom. 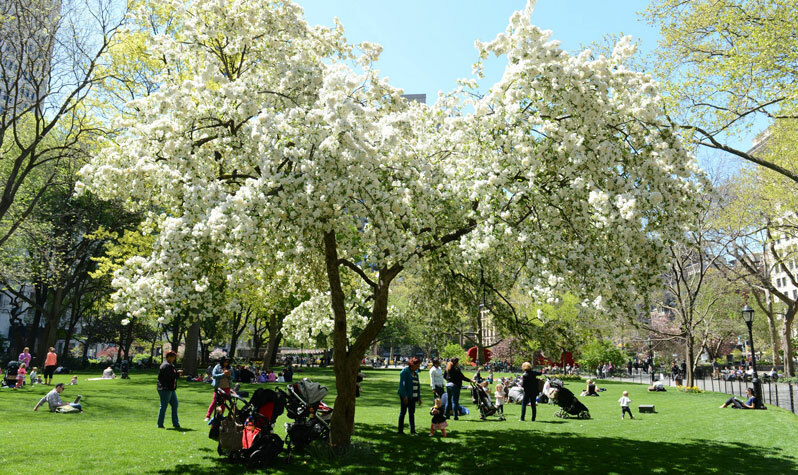 From the pear trees surrounding the Pulitzer Fountain at Grand Army Plaza to the Kanzan cherry trees in Sunset Park, from the crabapples in Madison Square Park to the magnolias in Central Park, the whole city is ablaze with natural color and beauty. You can even go on a Great Tree expedition and find those that have been officially designated for their size, species, or historical association. And the best thing is, all you and your dog have to do is get some fresh air, spend no money, and simply enjoy each other’s company in one of the greatest and pet friendliest cities in the world. Cherry trees on the Potomac. Speaking of trees, our nation’s capital has a reputation for some great ones—specifically cherry trees, 3,000 of them, on the National Mall. 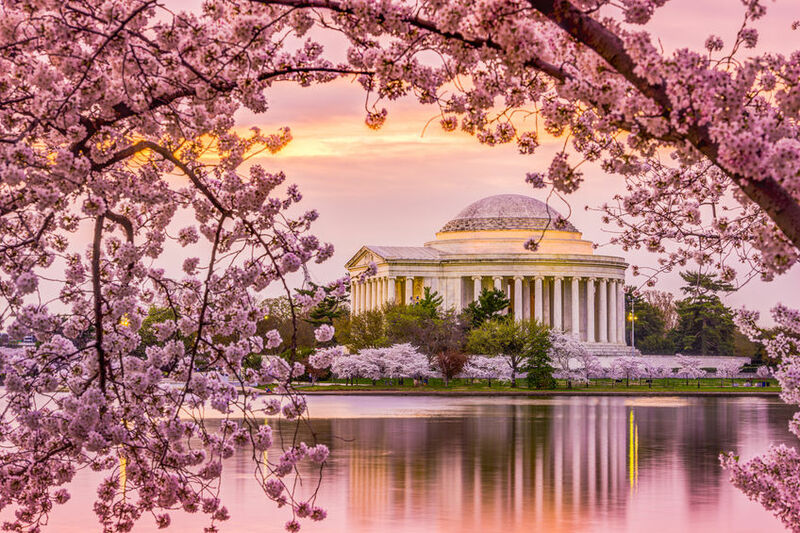 The National Cherry Blossom Festival runs from March 20 to April 13, 2019, offering tons of free events including the Blossom Kite Festival on the grounds of the Washington Monument, Petal Palooza which includes, live music, games and fireworks, and the National Cherry Blossom Festival Parade on Constitution Avenue between 7thand 17thStreets. Of course, there are plenty of other places to roam with your pet, including the National Arboretum, the Mount Vernon Trail and Lincoln Park. And, while you’re there, maybe stop in on your local representative and lobby for a “Dogs Stay Free Everywhere” amendment to the constitution. We’d vote for it. Okay. The Big Easy is great any season. But it’s really special in spring. The weather isn’t hot and steamy like in summer and there are tons of outdoor festivals for you to enjoy. You can grab some good eats at the Top Taco Fest, the NOLA Crawfish Festival, the Crawfish Mambo, and the New Orleans Oyster Festival. Whooee! Now, truth be told, they don’t permit pets but, hey, when has a bad pet policy gotten between you and a huge platter of crawdads? You are an advanced primate, right? The secret is not to take your dog in but to bring the food out so you can enjoy it on a park bench along with your pampered pooch. There are also plenty of parades like the Chris Owens French Quarter Easter Parade which is followed by the Gay Easter Parade. And don’t forget to hit the Café Du Monde to enjoy coffee and their famous beignets. When it comes to good food, hospitality and beautiful weather, New Orleans in the spring is the place to be.